You’ve recently came across a peculiar type of file with a .bak extension and you know you are supposed to restore it in order to get the data. This article will show you what to do in the case you have such a file and you need to open it to access the information. You probably guessed up until this point, if you didn’t already know, a .bak file is a backup file which contains the details or information related to a software system, the contents of a database or another file. 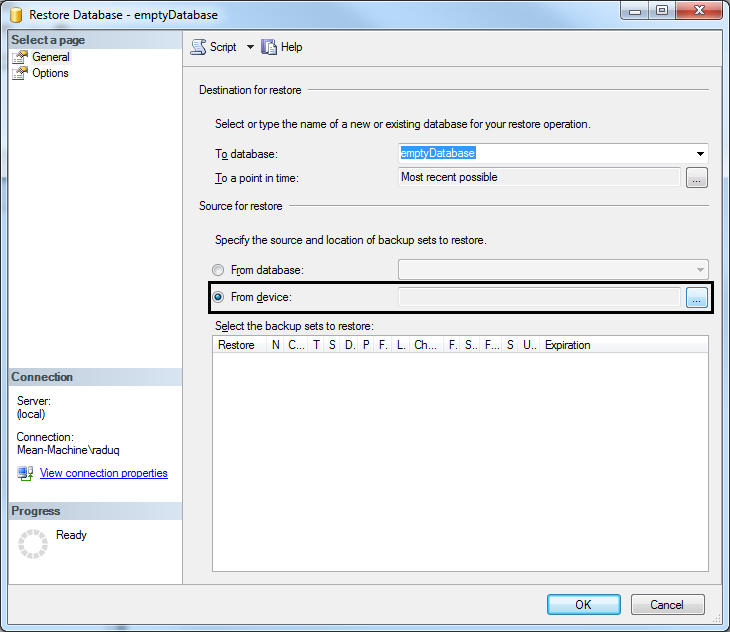 Most common .bak files nowadays are database backups of SQL Server databases, but there are still other programs (like SqlBak) that might create files with this extension. You can find a more detailed list here. Because this extension is used for backup files of any type there is no standardized format for creating .bak files, thus each program that creates .bak files can decide on how to format them. This also means that unlike other types of files, like .zip or .rar which have a standard after which they are created and how they are un-archived, there is no standard program for extracting/importing information from a .bak file. But there is still good news, as you don’t need to download a special program to view the contents of a .bak file, but the bad news is that there is a high chance that you will have to open each .bak file differently. How to open a .bak file? 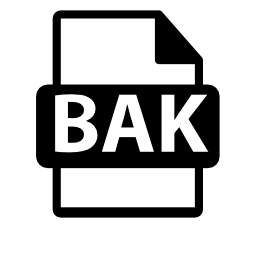 As we have already said, .bak files can be created by multiple programs and, if you don’t know anything about the file’s history than you will have to go through a few more steps in order to extract information from the file. If you do know a few details about the file’s history, like what program it has been exported from, just go to that program and see if there is a restore option for your file. But as this is a blog related to SQL Server and its backups the chances are higher that you want to open (or restore) the .bak file. Thus we will continue with how to open a backup file of a database. 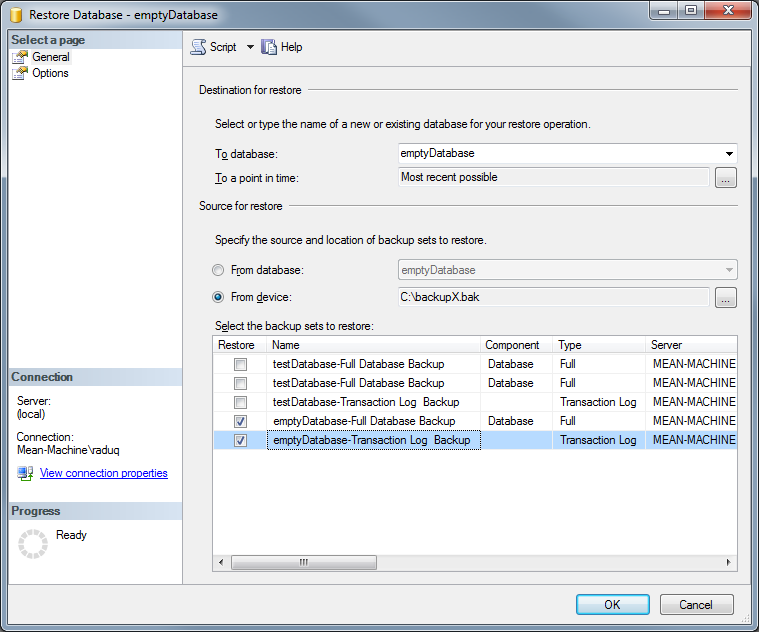 In order to see the information in a backup of a database you will have to restore it first. Unfortunately, there is no other way of seeing the information as it is formatted. You can try to open it with text editors like Notepad or similar software but you will just get a mess of characters displayed. How to restore a .bak file? As we said, there is no other way of opening and reading the contents of a SQL Server .bak file other than restoring it. 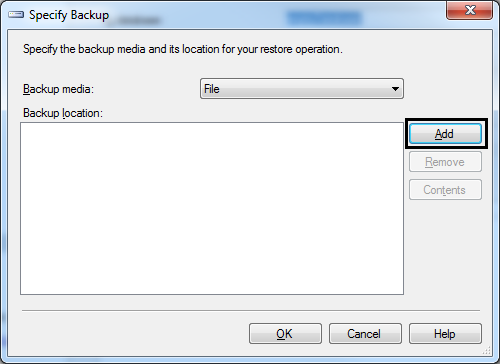 The process of restoring the backup file will create the table structures and insert the data, depending on the type of backup file that it is. 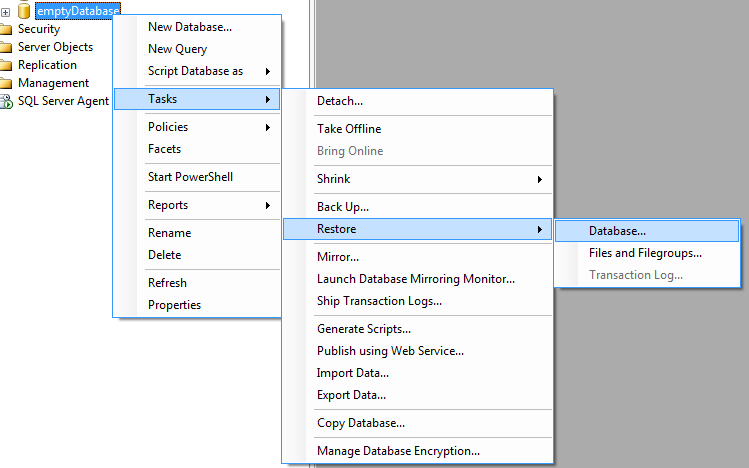 To restore a .bak file using SQL Server Management Studio (SSMS) you must do the following steps. 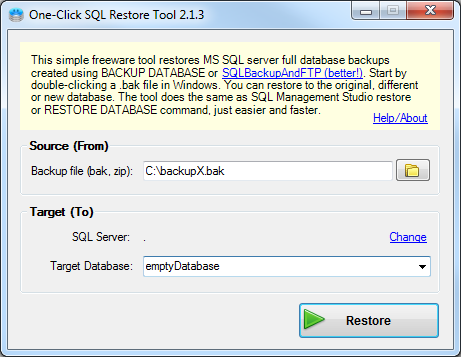 On the database you want to restore, right click it then go to Tasks -> Restore -> Database, as can be seen below. Then check the radio button From device and click on the button to browse for the location of the .bak file. You will get to a screen like the one below where you will have to click on Add in order to choose the .bak file. The next screen that appears will be similar to the one below, where you will have to go to the folder that contains your .bak file and select it for restoring. 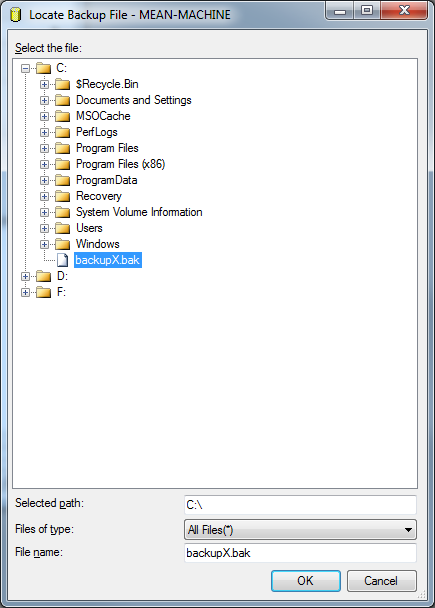 Once you have selected the file, click OK and then OK again until you get back to this screen where you will have to select the backups you want to restore. You will have tot tick both the FULL backup type and the Transaction log in order for the restore process to succeed. Once you selected them you press OK and you should pretty soon (depending on your backup’s size) get a message similar to this. And this is all you have to do. Now your database should be online and you will be able to access the data inside it. How to restore a .bak file MUCH FASTER? There is a simpler option to avoid doing all this through SSMS, or even if you don’t have SSMS available. Just download a free program called One-Click Restore and you can restore your .bak file MUCH FASTER. Thank you I managed to open a database. Hi. Does the free program restore a SQL Server 2016 backup file into a SQL Server instance previous to 2016? Thanks a lot. Regards. Ariel from Argentina. Hi. I have a sql backup file with extension .bak. I need a data from that backup file with images . How can i retrieve images from that sqlbak file.Please help to get out of these problems. I have been trying to open a Bak file which i don’t really know the originated program that created the Bak file, it may be sql, dbase or so, but i am not sure, i have used several acclaimed software program but none was able to open it, pls which software program can easily open it? So once the bak file is restored, how do you open it?